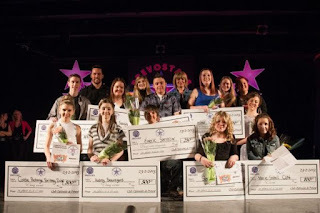 The Optimist Club of Prevost, Saint-Jérôme, Quebec held the Ninth Annual Talent show on February 23, 2013. Thirty young people, aged 9 to 17, performed song, dance, theater and circus acts before a crowd of more than 600 people. Three prizes were awarded in each age category: 1st place - $500; 2nd place - $250; and 3rd place $100. In the 15-17 year category, Coralie Roberge and Brittany Dube won first prize, Vicky Auger-Tremblay won second and David Briere won third. In the 12-14 year category, Marilou Chalifoux took first place, Vincent Dagenais, second and Marie-Soleil Side place third. In the 9- 11 year category, Audrey Beauregard placed first, Emeric Sarrazin placed second and Sarah Martel placed third. All winners are shown in this photo. Thanks to the Optimist Club of Prevost for sharing the picture. I think that big Optimist Club checks are awesome! The music is vaguely reminiscent of the Wii dancing game that came with the original Wii Fit package, but the characters are much more engaging. Not to mention, I'm a huge fan of the Let's Move Campaign to get children off their seats and active. Do this now: Get up off of your seat and join First Lady Michelle Obama and Jimmy Fallon in the "Evolution of Mom Dancing." Since I'm too late for Music Sunday at Experience Optimism this week, we'll just call it the Get Moving Monday edition. There may not ever be a repeat; but then, one never knows. I love this answer. 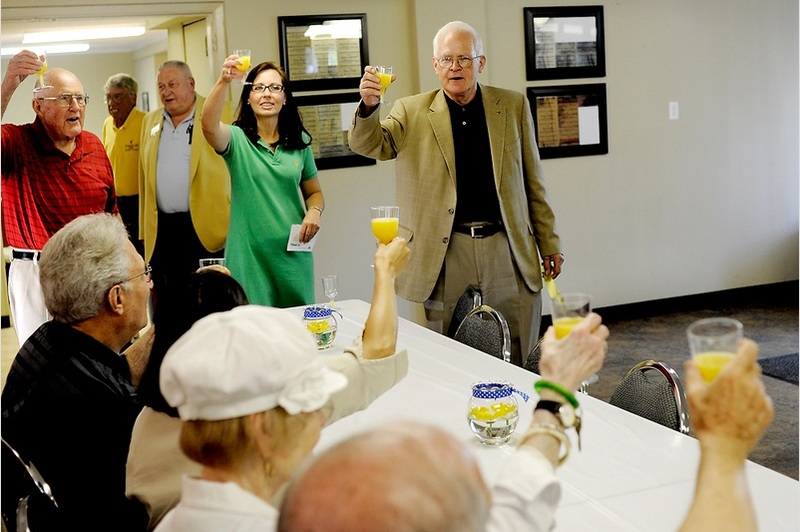 Optimist Clubs and other service organizations fear that they are "graying." In other words, as baby boomers continue to age, the average age of a service club member continues to rise. In some circles it becomes a great topic of discussion as members lament what they might do to stop this progression. In some remote fear, I believe they think that the lights will turn out when the last one dies. As an answer to this question, one woman recently deadpanned, "The best way to bring down the average age in a club is to induct more women because, as everybody knows, women never get older than 39." The answer made me laugh, but more important, the answer is true. Women don't worry about their age when it is time to serve others. They find a way to complete their task and usually make everyone feel better by doing it. Men, well, not so much. Men are more used to being in leadership positions and it isn't so easy for them to step aside and let others take the reins, provide creativity and assume responsibility. However, if our service clubs are to survive, and I believe they will, we must acknowledge that it is not our service clubs that are growing older; it is our society. 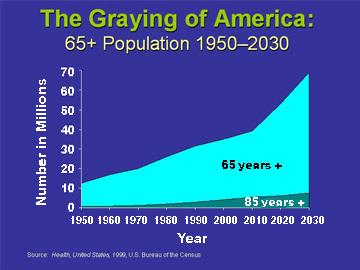 Call it the Graying of America. This graph by the US Census Bureau shows Americans aging at a staggering rate. According to The Fiscal Times, as of 2010, 24% of the US population is over 50 years of age, while 17 million Americans are between the ages of 75 and 85. By 2050, it claims that there will be more 30 million individuals over 75 years old. We live longer and healthier lives today than our ancestors, those who started our service clubs with great purpose to serve. I can't imagine that our founders of Rotary, Kiwanis, Lions and Optimist Clubs envisioned a time that an individual would be too old to participate and I can't either. It's time we stop worrying about the age of our members and put more effort into the programs that make our individual clubs relevant to the communities they serve. Relevance, combined with the "find a way" mindset of the 39-year-old woman, will help our clubs grow in members and and service. I venture to say, it might just help them to decrease in average age as well. Adam Levine and Maroon 5 share the spotlight and the profits with "Daylight (Playing for Change)." Playing for Change is a music project that brings musicians together from across the globe. All profits from their work go to a nonprofit foundation that builds music schools for children around the world. I became an Adam Levine fan as I watched him on The Voice, but I'm genuinely impressed with all that he does to share his talents to make the world better for others. I wouldn't have known about this project without his involvement and it so fits with the Optimist International mission of helping children reach their full potential that I wanted to share it with you. Currently, there are 8 programs that are funded by the foundation. It serves communities in Ghana, Nepal, Rwanda, Mali and South Africa. Its mission is to create positive social change through music education. In addition to providing a "creative alternative to the struggles that many of these children face daily," Playing for Change creates jobs. Each school belongs to the community and they use local teachers and labor for the buildings. Community members are the administrators. Whenever possible, the instruments are made by local artisans with local materials. Some say it takes a village to raise a child. I say it takes a village to accept change. Playing for Change shares the universal language of music in an effort to affect change, bring peace to communities, and peace to the world. It's that time of year that every Optimist Club looks forward to: Optimist Oratorical Contest season. For the next few months, clubs will work with and hear from students on the topic, "Why My Voice is Important." All contests start at the club level. Every Optimist Club determines what the club level prize will be for their contestants. Some opt for medallions or trophies while others provide scholarships of varying amounts. However, all students are competing for a district scholarship award of $2,500. Districts also have the opportunity to determine how prizes are awarded. Some have boy and girl categories where the first place boy speaker and girl speaker each receive $2,500. Other districts combine the genders and award three prizes of $2,500, $1,500 and $1,000. One thing is universal. The talent of the students and their courage for participating is inspirational. I look forward to it every year. 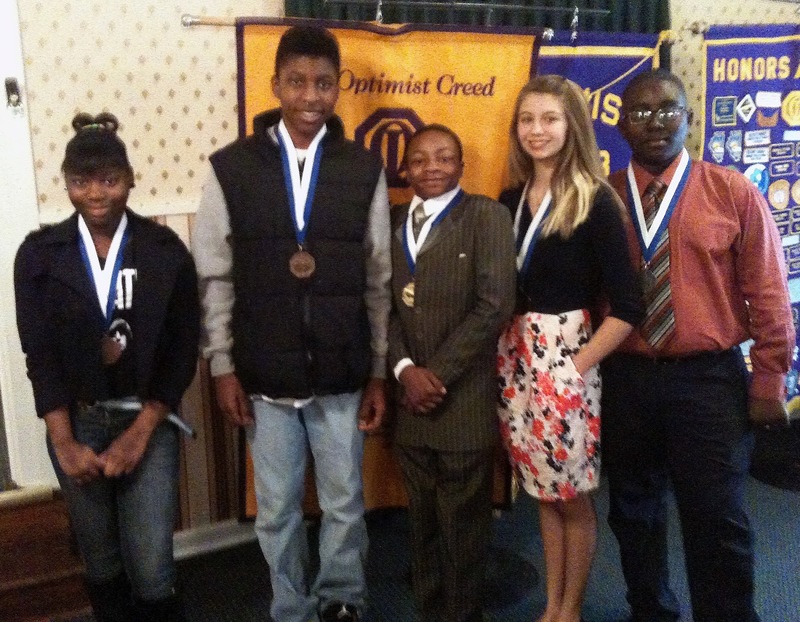 The Optimist Club of Belleville, Illinois held its club level contest on February 12, 2013. Shown here are Armoni Perryman, Nycholas Cole, Damon Sanders, Katie Cottle, and Mahlik Good. Damon and Katie finished in first place and earned a $100 cash prize. They will advance to the Illinois District regional contest in Springfield, Illinois on March 23. If you or someone you know would like to participate in the Optimist International Oratorical Contest, please download the application here and then locate an Optimist Club near you to get involved. Through its purposes, Optimist International encourages an interest in good government and civic affairs and inspires respect for the law. Many Optimist Clubs host Respect for Law activities by honoring first responders. However, a few show their work with children through the Respect for Law program. The Optimist Club of Virginia Beach is one of the latter. 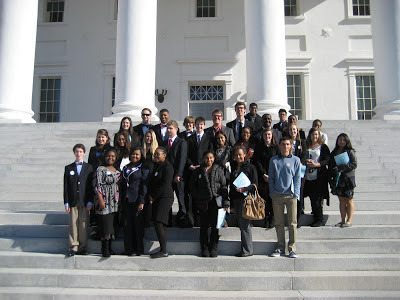 On February 14, 2013, the Virginia Beach Optimist Club took students from 11 schools to the Capitol for a General Assembly visit. Legislators, beware! Our students aren't afraid to demonstrate their positive attitudes with ideas that will make our world a better place to live. "I belong with you; you belong with me. You're my sweetheart." That's the part I sing along to every time I hear the Lumineers perform "Ho, Hey." It seemed the perfect refrain for a Valentine's Day week post. The performers sing of companionship in this perky ditty and when you love somebody, what you want most is their time. Let this be a reminder to give those that you love your time with your full heart and attention. And soon, you might just want to sing along too. The Lumineers have been nominated in the Best New Artist and Best Americana Artist categories in the Grammy Awards that will appear tonight, February 10, 2013. They believe their best chance of winning will come in the Best American Artist section. You have to agree, the song does sound vintage USA. Good luck tonight. The Downtown Optimist Club of Columbia, Missouri has invested more than $1 million in its community. And if that's not worthy of a celebration by itself, this certainly is. This year, the club is also celebrating its 75th Anniversary. Over the years, the Downtown Optimist Club has sponsored many activities including the annual Soap Box Derby, bicycle safety event and essay contest. On a large scale, the club was instrumental in the creation of Rock Bridge Memorial State Park. Like all Optimist Clubs, the Downtown Optimist Club of Columbia gives special attention to projects that help children. "We focus on children because we feel like if we can help them early, they won't have problems later," said Gary Anderson, board member. "They will have a sense of who they are and what they're doing if we support them." 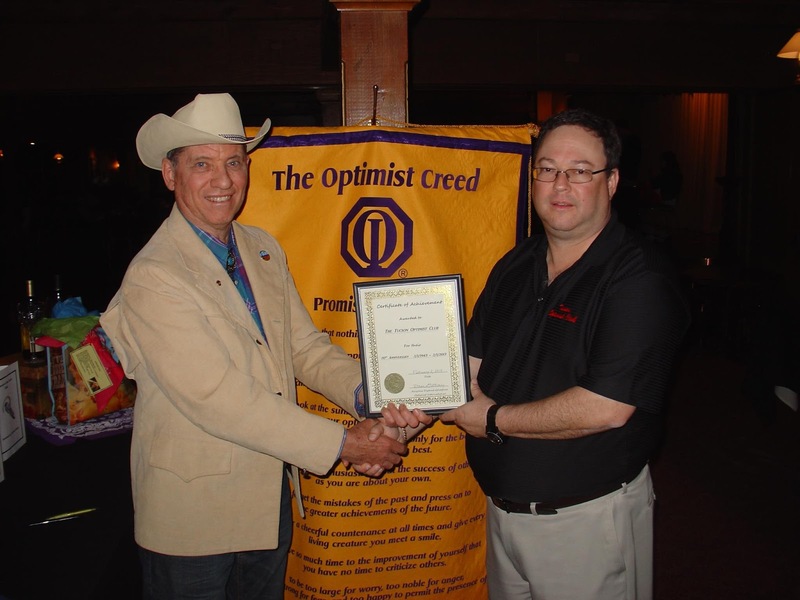 Additionally, the club gives attention to its members and the community by encouraging them to live by the Optimist Creed. For 75 years, they have always endeavored to be strong, optimistic, cheerful, and to bring those feelings to everyone they meet. 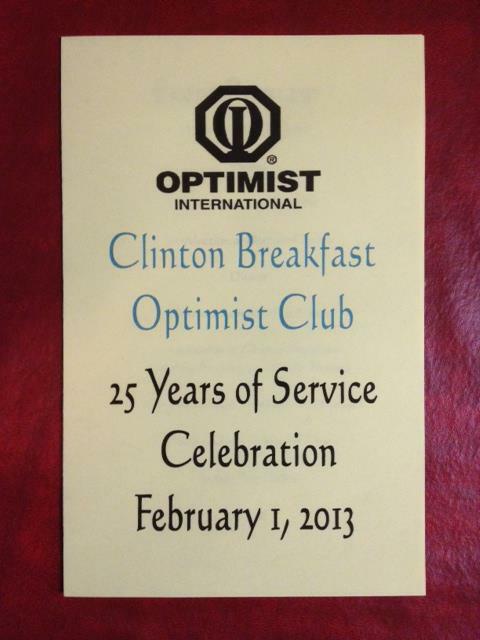 On February 1, 2013, the Breakfast Optimist Club of Clinton, Indiana celebrated 25 years of service its community. The celebration included more than 80 attendees including Past Optimist International President John Reel and an assortment of other Optimist Club members and District leaders. 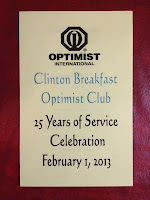 During the event, five new members were inducted to the Clinton Breakfast Optimist Club. As part of its outreach, the Clinton Breakfast Optimist Club offers youth soccer and bowling. Find out more about them on Facebook. Congratulations on this milestone. And thank you for your service. There are 24 Optimist Clubs serving the southern Tucson, Arizona area. On Saturday, February 2, one celebrated its 70th Anniversary. Congratulations to the Tucson Optimist Club for achievement and thank you for your many years of service. The governor of the Arizona District, Dean Gibboney, is shown presenting a certificate to club president Brian Goldstein and the Tucson Optimist Club members. In true Optimist Club fashion, the club celebrated with a dinner, dance, and silent auction. The auction, of course, is earmarked for community service projects that benefit children. That's optimism! Thanks to Jim Smith for the photo. My third word that I have chosen to live by in 2013 is active; however, sadly, I have not been living up to my resolution. Yet. This week, my Music Sunday choice at Experience Optimism is supposed to help me change all that. I can't think of a song that I've heard in a long time that encourages movement more than "Back it Up" by Caro Emerald. It inspires me to get active. I hope that it does the same for you for one of the greatest and easiest ways to promote health and well-being is to move. The The Physical Activity Guidelines for Americans recommends 30 minutes of physical activity a day for adults, 60 minutes for children, at least five days a week. According to their website, it shouldn't be considered a daunting task. Walking and stretching are some simple solutions. Find out more here. Insurance providers Blue Cross Blue Shield have encouraged schools to help children be more active with "Get Active, Get Fit." First Lady Michelle Obama endorses the "Let's Move" program for fitness. Now I need to take my own advice, pick one and get active! The Optimist Club of Bixby, Oklahoma is off to an early start with this year's Optimist International Oratorical Contest and they went to YouTube to let the student speakers tell us about it. The Optimist International Oratorical Contest takes place between January and May and all Optimist Clubs use the same topic to launch the students on their way to a $2,500 scholarship. Funded by the Optimist International Foundation, approximately $150,000 is given away annually. The official topic for 2012-2013 is "Why My Voice is Important." Download the Optimist International Oratorical Contest application. Find out more about the contest at Optimist.org.